It turns out that I possess heretofore unsuspected powers. If I express my displeasure on the internets, the universe will make things right. All I had to do was grouse about not being able to see the rarity Hollywood Story at Noir City Los Angeles and a reader of the blog, the redoubtable John Hall, sent me a copy of the movie. Now to use this gift judiciously. Friday should be National Donut Day. I’d like to see Armando Galarraga pitch another, official perfect game. And I wish Hollywood Story were better. William Castle directs this B-movie riff on the previous year’s Sunset Blvd. 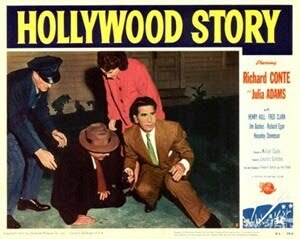 Richard Conte is Larry O’Brien, a New York producer who finally moves to the Left Coast. When he learns that the mothballed studio he’s taking over was the scene of Tinseltown’s most famous unsolved murder, he’s found his first new project. And he’s not about to let the police or the box office stop him from tracking down the killer. Hollywood Story is loosely based on the case of silent film director William Desmond Taylor. (For a better fictionalized unraveling of that sordid affair, may I suggest Nina Revoyr’s The Age of Dreaming.) After a great opening sequence featuring early ‘50s L.A. street scenes, things go off the rails in a hurry. Jim Backus is playing an agent only peripherally involved with what’s going on. So why give him the voiceover? Silent era stars like Francis X. Bushman appear – but as themselves, in a single scene in which they talk about how great it is to be working on a movie before they toddle off, never to be seen again. Conte gives his usual solid performance even though he’s saddled with a ridiculous character who insists on investigating the crime himself in the interest of verisimilitude. (Although, to be fair, Jerry Bruckheimer did personally demolish some space junk prior to the shooting of Armageddon.) The movie’s greatest problem is the paucity of viable suspects. Only a handful of characters were present during the events of twenty years earlier, and most of them can be eliminated by the ham-fisted way they’re introduced. The reveal of the guilty party is no big surprise, but it is cleverly staged. On the whole Hollywood Story is a talky disappointment. I’m still glad I saw it. It has a genuine love of showbiz lore on its side. Not to mention a pretentious hack writer named Vince. For that reason alone, I’m in John’s debt. By coincidence, I watched the 2007 documentary Spine Tingler! : The William Castle Story around the same time. It (understandably) overlooks the interesting crime dramas Castle made in the 1940s and ‘50s like my beloved Whistler series in favor of his gimmicky horror films like, well, The Tingler. But it’s a lot of fun.